This Caribbean area stretches from St Vincent in the North down towards Geneda in the South. Yachts have been chartered in Kingston (the capital of St Vincent) for centuries. This area has a rich maritime history, much of it in and around Admiralty Bay. 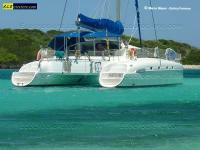 For nature lovers the Tobago Cays in the Grenadines provide an unspoilt anchorage to go snorkelling.